Wake and Midway battles. These revetments still exist undocumented. battlefields is seeing the Ewa Battlefield sites. 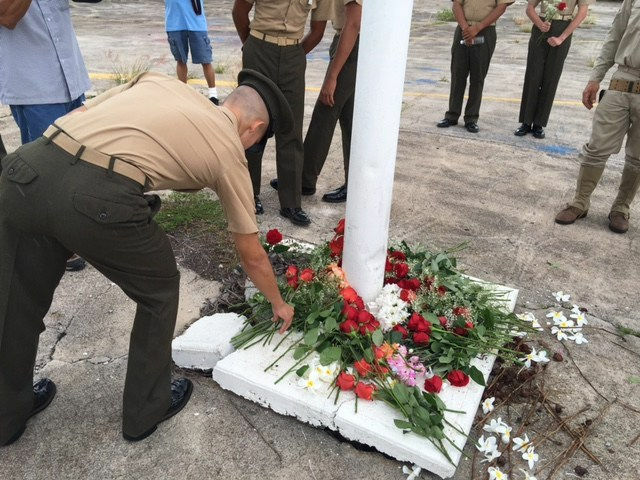 It is important to realize that the battles of Ewa Field, Wake and Midway were borne by the many sacrifices made by Ewa Marines in 1941 and early 1942. 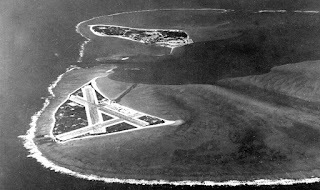 The Ewa Battlefield, Wake Island and Midway Island can all be linked to Ewa Field. All of the planes and pilots came from Ewa Field. 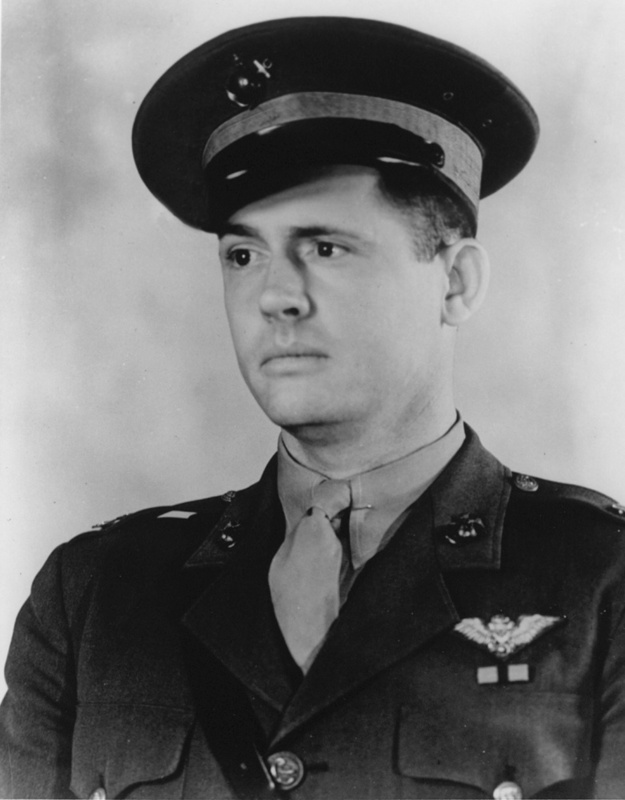 The only Medal of Honor of the Midway battle was given to Ewa Field Capt. Both had the main roads at MCAS Ewa named for them, as was the case with other KIA Medal of Honor USMC pilots. However when the Navy took over the property they renamed all of them after Navy ships. 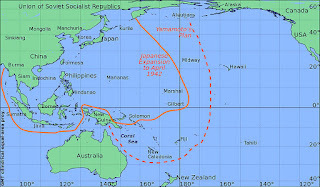 Japanese expansion and power in the Pacific was at its height in 1941 and early 1942. 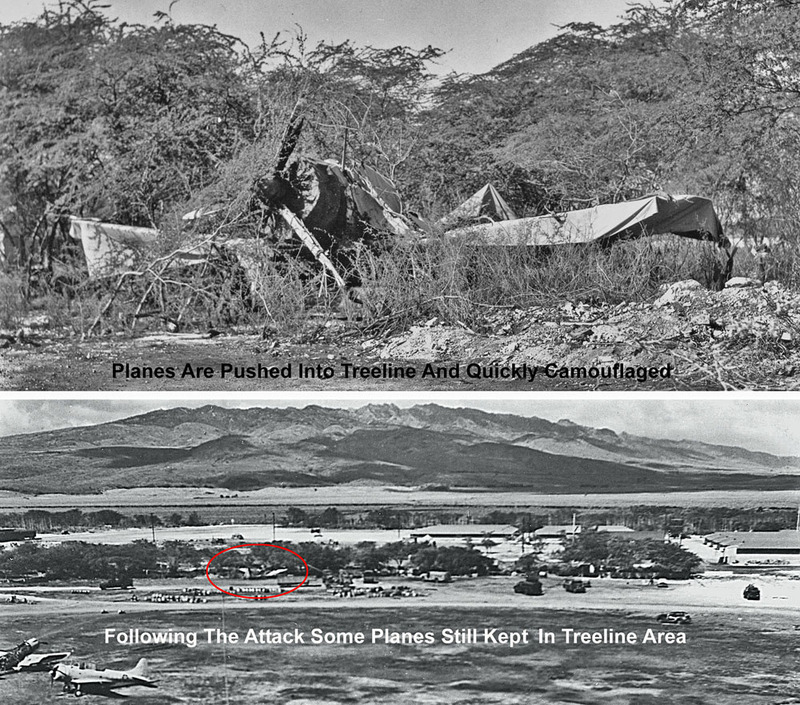 You might think that the recognized National Register Ewa Battlefield would have well documented research on the entire area of the 1941 Ewa airfield - which served as the front line base of Marine Corp air defense of Pearl Harbor as well as Wake Island and Midway Island. 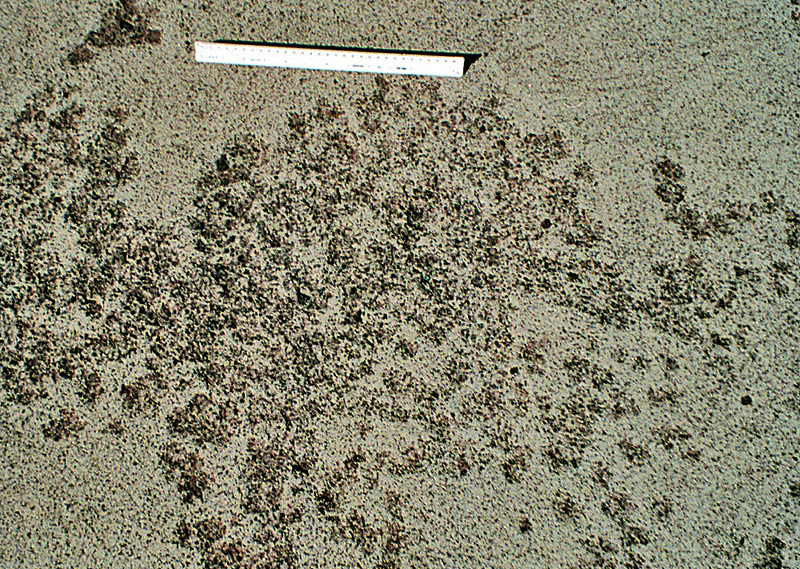 However much of the physical 1941-42 area remains largely undocumented. In fact there has never even been any official search or documentation on all of the large number of incoming and outgoing bullets and anti-aircraft artillery that landed all over the Ewa air base and surrounding villages. tarps and anything else over them. before the air attack on the Marine airfield where most of the remaining planes were destroyed. The next big air attack fortunately did not come as it was determined that the Japanese surface fleet had left Hawaiian waters. However the IJN submarines remained and shelled island ports up through the end of December, keeping everyone guessing as to what might happen next. were fighting for their lives. By the end of December 1941 they were overrun. leaving the Marines to their fate. 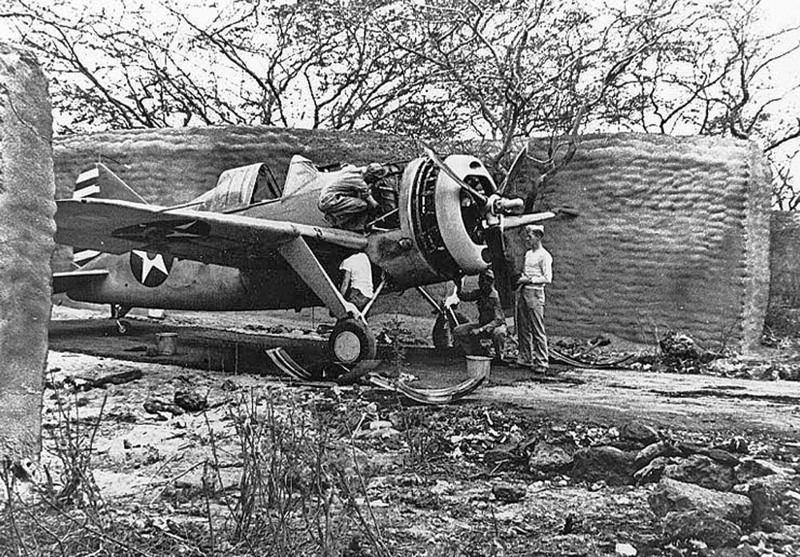 Lost Marine planes at Ewa and Wake were replaced by planes the Navy didn't want their pilots using the Brewster which became regarded as a flying coffin when pitted against Japanese Zeros. 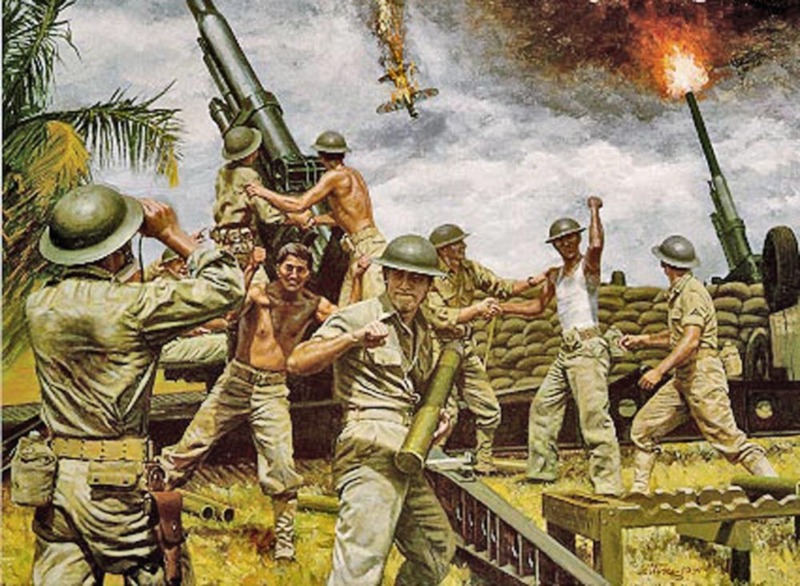 While the Marines’ actions in the early Pacific War are not as well known or as successful as those of their Navy counterparts they fought with what they had. 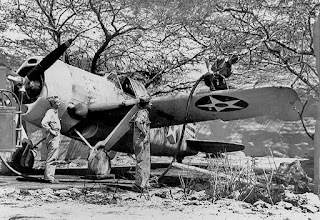 Marine Fighter pilots had to engage some of the most experienced Japanese pilots flying vastly superior Zero fighters with outdated airplanes and inexperienced aircrews thrown into air combat. As we remember the sacrifices made by the men of Midway let us not forget the gallant and brave Marines of VMF-221 and VSMB-241. Those Marine planes and aircrews came from the still existing and largely undocumented early 1942 revetments at MCAS Ewa Field. 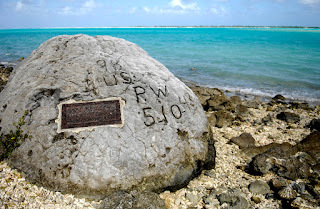 Neither the Navy or NPS acknowledge these historic Pacific War sites exist. 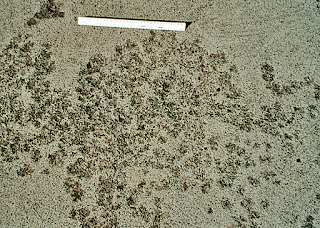 at Midway by Capt. Kirk Armistead, USMC. 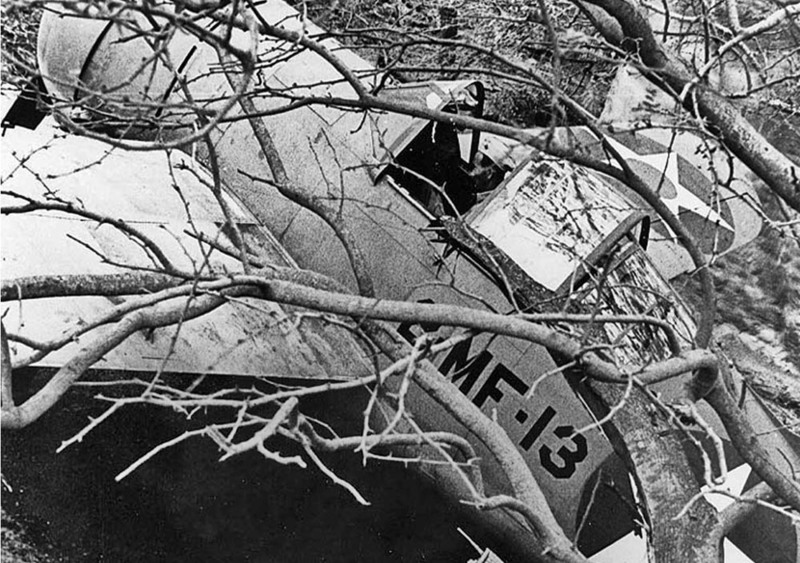 This badly shot up plane survived when most didn't. after a brutal air engagement with Japanese fighters and dive bombers. 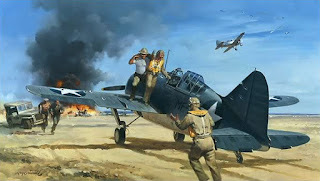 Here are the combat reports of the VMF-221 Brewster and Wildcat pilots during the Battle of Midway, by Mark E. Horan, military author and historian. My airplane was an F2A-3, Bureau number 01562. My guns were loaded with 2 tracers, 2 armor piercing, 1 ball and 1 incendiary every six rounds. While on standby on the morning of June 4, 1942, the air raid alarm was sounded at 0555. As our engines were turning up, we did not hear the alarm: but inquired, and found that it had been sounded. At approximately 0602 we took off. 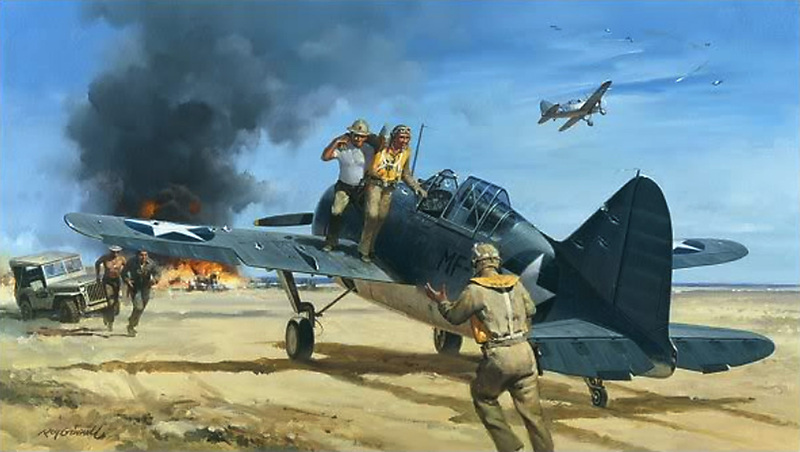 My division consisted of six F2A-3 airplanes, piloted by myself, Lt. Sandoval, Capt. Humberd, Lt. Brooks, Lt. Kunz, and Lt. Mahannah. Capt. Humberd was leading the second section, and Lt. Kunz was leading the third section. I climbed the division to 5,000 feet at which time the base station instructed me to climb to 12,000 feet and vector 310o. I then received instructions to vector 320o. at about 0620 I heard Capt. Carey transmit "Tally-ho' followed by hawks at angels 14, supported by fighters. I then started climbing, and sighted the enemy at approximately 14,000 feet at a distance of 5 to 7 miles out, and approximately 2 miles to my right. I immediately turned to a heading of about 70o and continued to climb. 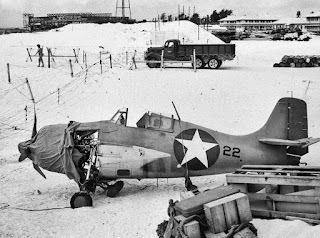 2-MF-13 at a still existing and undocumented early 1942 Ewa Field revetment, Ewa. I was endeavoring to get a position above and ahead of the enemy and come down out of the sun. however, I was unable to reach this point in time. I was at 17,000 feet when I started my attack. The target consisted of five divisions of from 5 to 9 planes each, flying in division Vees. 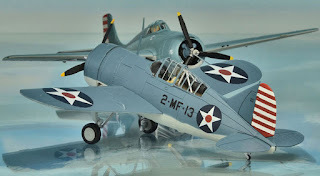 I figured this group to consist of from 30 to 40 dive bombers of the Aichi Type 99 SE DB. I was followed in column by five F2A-3 fighters and one F4F-3 fighter, pilot unknown. I made a head on approach from above at a steep angle and at very high speed on the fourth enemy division which consisted of five planes. I saw my incendiary bullets travel from a point in front of the leader, up thru his plane and back through the planes on the left wing of the Vee. I continued in my dive, and looking back, saw two or three of those planes falling in flames. Some of the planes in my division centered their attack on the fifth enemy division. After my pullout, I zoomed back to an altitude of 14,000 feet, at this time I noticed another group of the same type bombers following along in their path. I looked back over my shoulder and about 2,00 feet below and behind me I saw three fighters in column, climbing up towards me, which I assumed to be planes of my division. However, they climbed at a very high rate, and a very steep path. 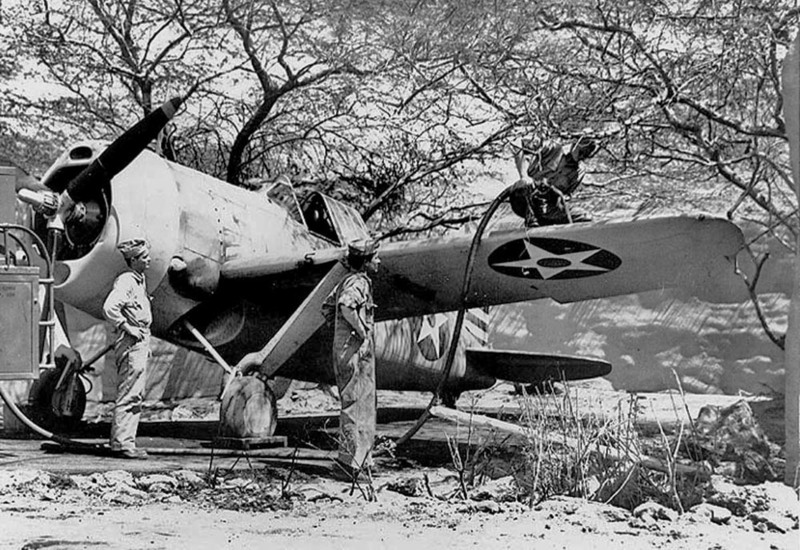 2-MF-13 being fueled up in undocumented early 1942 Ewa Field revetment, Ewa. When the nearest plane was about 500 feet below and behind me I realized that it was a Japanese Zero Fighter. I kicked over in a violent split S and received 3-20 MM shells, one in the right wing gun, one in the right wing root tank, and one in the top left side of the engine cowling. I also received about 20-7.7 off a portion of the aileron, which mangled the tab on the aileron, and sawed off a portion of the aileron. I continued in a vertical dive at full throttle, corkscrewing to the left, due to the effect of the damaged aileron. At about 3,000 feet, I started to pull out, and managed to hold the plane level at an altitude of 500 feet. As the speed decreased, the stick pressure became more manageable, and by giving it full left tab, at a low speed, the pressure was negligible. I headed back towards the area, and called the base radio, asking them if I could land because of a damage aileron. I received their "Roger, wait". I circled the area at a distance of about 15 miles, and saw that the area was under heavy attack, so I proceeded to a spot up-sun from the area; and circled. At approximately 0740 I heard the base radio call the fifth division and advise them to land, refuel, and re-arm. I could hear no reply, so asked for permission to land. I received an affirmative reply, so headed towards the area. I gave two recognition signals, circled the field, and was not fired at by anti-aircraft batteries. My hydraulic system had been damaged, but the landing gear and flaps operated normally. The right brake was inoperative. A successful landing was effected at approximately 0800. 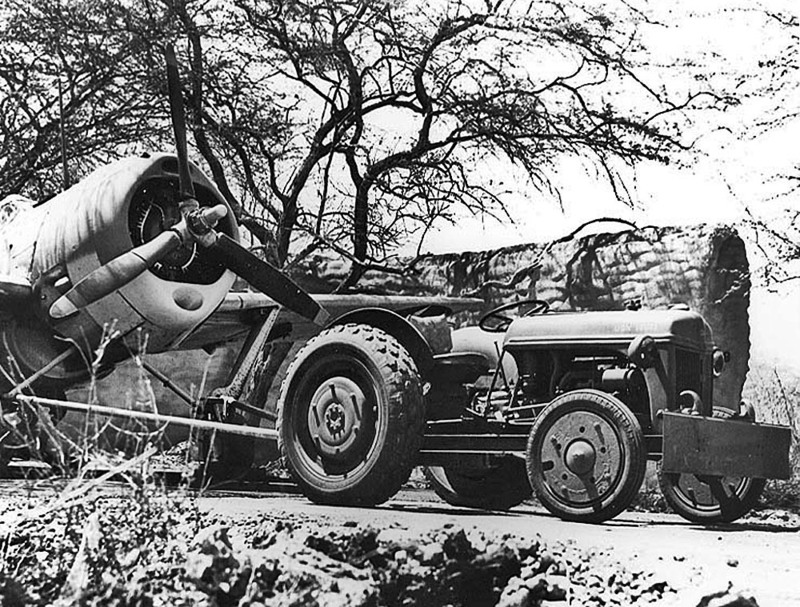 2-MF-13 ready for towing from undocumented early 1942 Ewa Field revetment, Ewa. The Zero fighter is exceptionally maneuverable, with an astounding rate of climb. It is capable of closing the range on an F2A-3 in a climb to such an extent that it seems useless to even try to make more than one pass at any target. It is my belief that they can climb at least 5,000 feet a minute, as these fighters climbing up at me were pointed at an angle of 50o in their climb. I do not believe that they were zooming after a dive, because I am normally certain that at the time I attacked the bombers there were no enemy fighters above 14,000 feet. In fact, I believe that they were below the bombers at that time. The Zero Fighter is faster in level flight than the F2A-3. It is much more maneuverable that the F2A-3. It can out climb the F2A-3. It has more fire power than the F2A-3. In general, the Japanese airplanes appear to be very vulnerable to .50 cal. Gun fire. They burst into flame in nearly all cases upon receiving any bullets. It is my belief that the use of incendiary bullets greatly increases the effectiveness of attack against Japanese air craft. 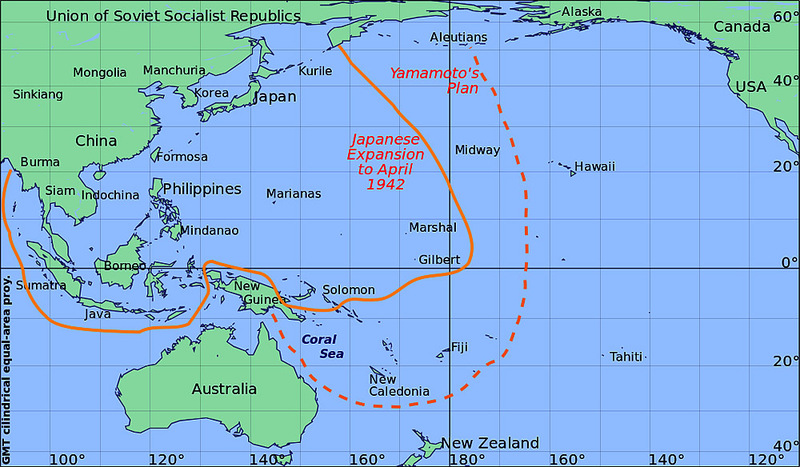 shipment to Midway Islands, in May 1942. 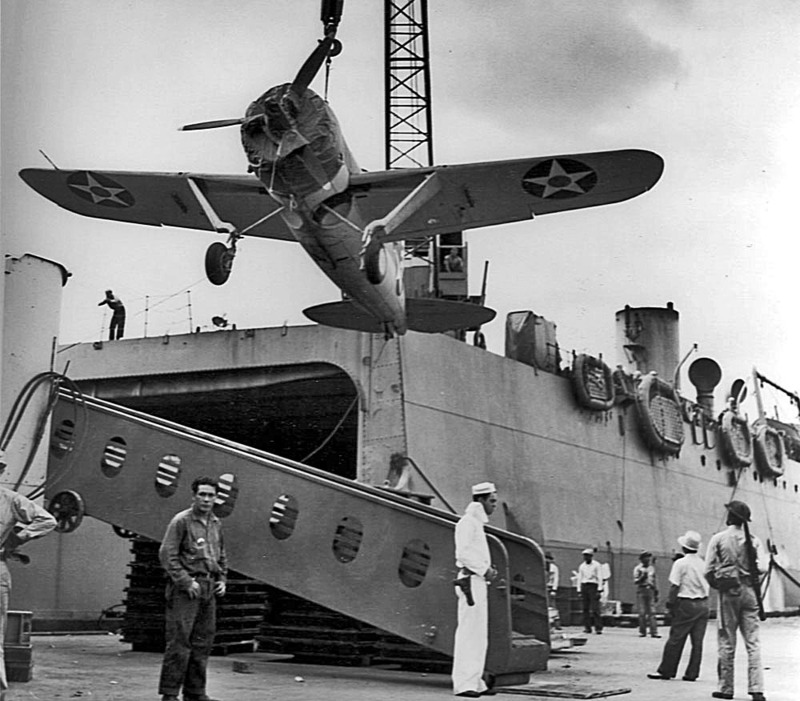 Midway on 26 May 1942. The last remaining Marine fighter pilot of VMF-221 from the battle of Midway, Williams Brooks died in January 2010 and was buried with full military honors, in Bellview, Nebraska. 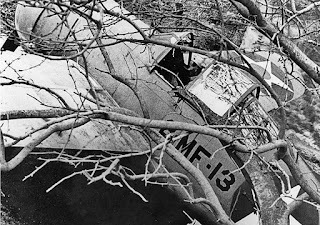 I was pilot of F2A-3, Bureau number 01523, Our division under Capt. 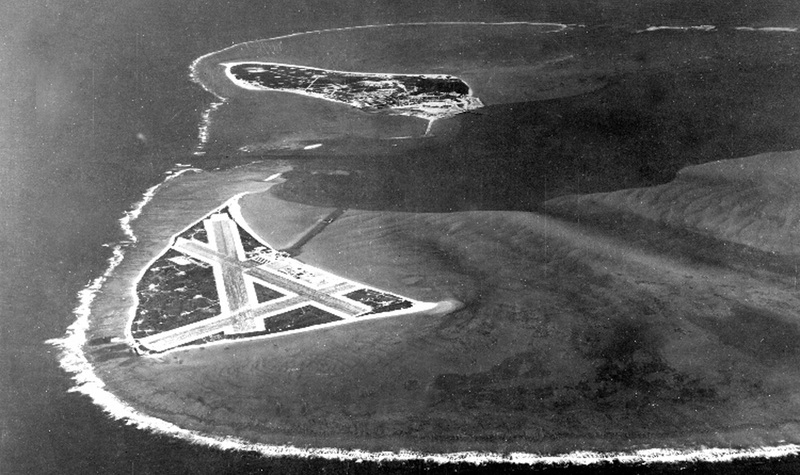 Armistead was on standby duty at he end of the runway on the morning of June 4, 1942, from 0415 until 0615. At about 0600, the alarm sounded and we took off. My division climbed rapidly, and I was having a hard time keeping up. I discovered afterwards that although my wheels indicator and hydraulic pressure indicator both registered “wheels up”, they were in reality about 1/3 of the way down. We sighted the enemy at about 14,000 feet, I would say that there were 40 to 50 planes. At this time Lt. Sandoval was also dropping back. My radio was at this time putting out no volume, so I could not get the message from Zed. At 17,000 feet, Capt. Armistead led the attack followed closely by Capt. Humberd. 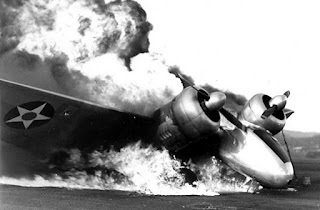 They went down the left of the Vee , leaving two planes burning. Lt. Sandoval went down the right side of the formation and I followed. One of us got a plane from the right side of the Vee. At this time, I had completely lost sight of my division. As I started to pull up for another run on the bombers, I was attacked by two fighters. Because my wheels being jammed 1/3 way down, I could not out dive these planes, but managed to dodge them and fire a burst or so into them as they went past me and as I headed for the water. As I circled the island, the anti-aircraft fire drove them away. My tabs, instruments and cockpit were shot up to quite an extent at this time and I was intending to come in for a landing. It was at this time that I noticed that a important feature in their fighting. I saw two planes dog-fighting over in the east, and decided to go help my friend if at all possible. My plane was working very poorly, and my climb was slow. As I neared the fight both planes turned on me. It was then that I realized I had been tricked in a sham battle put on by two Japs and I failed to recognize this because of the sun in my eyes. 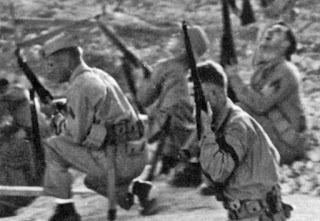 Then I say I was out-numbered, I turned and made a fast retreat for the island, collecting a goodly number of bullets on the way. After one of these planes had been shaken, I managed to get a good burst into another as we passed head-on when I turned into him. I don’t believe this ship could have gotten back to his carrier, because he immediately turned away and started north and down. I again decided to land, but as I circled the island I saw two Japs on a Brewster. Three of my guns were jammed, but I cut across the island, firing as I went with one gun. But I could not get there in time to help the American flier and as soon as the Brewster had gone into the water I came in for a landing at approximately 0715 (estimated). 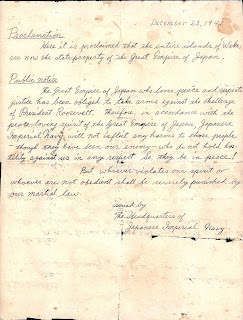 June 4, 12 were lost to the enemy. 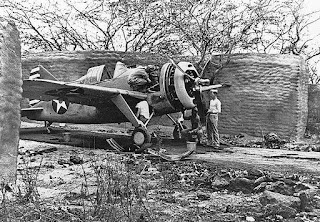 F4F Wildcat flown by Capt. 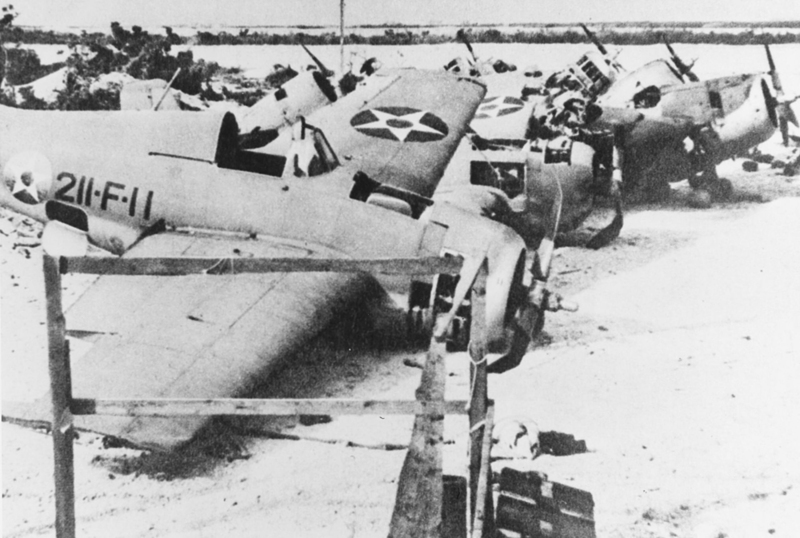 Henry T. Elrod and other planes destroyed on Wake Island after continuous Japanese assault. Elrod continued to fight on the ground until killed by enemy fire. On 5 October 1943, American naval aircraft from Yorktown raided Wake. 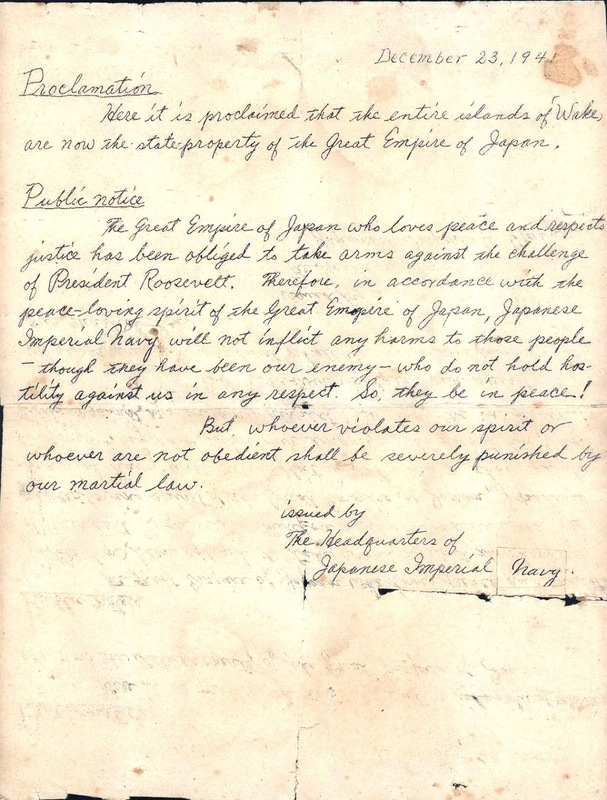 Two days later, fearing an imminent invasion, Japanese Rear Admiral Shigematsu Sakaibara ordered the execution of the 98 captive American civilian workers who had initially been kept to perform forced labor. They were taken to the northern end of the island, blindfolded and executed with a machine gun. 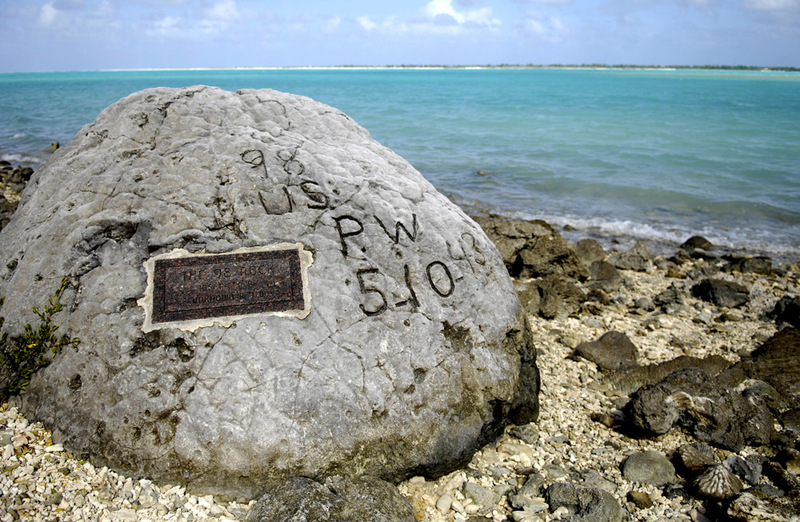 One of the prisoners (whose name has never been discovered) escaped, apparently returning to the site to carve the message "98 US PW 5-10-43" on a large coral rock near where the victims had been hastily buried in a mass grave. Damaged Grumman F4F Wildcat on Midway Island after Japanese assaults ended.